Reuters writer Missy Ryan reported this morning that, “A bipartisan group of U.S. senators urged the Bush administration to reject deep cuts to U.S. cotton subsidies in world trade talks, promising to oppose any agreement with major subsidy reforms that some poor countries insist they need to compete on world markets. “‘We cannot abandon a group of farmers who have operated within the parameters of a program written to comply’ with existing trade rules, Sen. Saxby Chambliss of Georgia and nine other southern lawmakers said on Thursday in a letter to U.S. Trade Representative Susan Schwab. The Reuters article indicated that, “The U.S. cotton industry, which produces 40 percent of the cotton on world markets, wields major political clout in Congress, but it has suffered setbacks since Brazil triumphed several years ago in a WTO case against its subsidies. Despite the recent dip in corn prices, USDA’s National Agricultural Statistics Service reminded readers in their August 31 Agricultural Prices report that corn prices are still high from an historic perspective. “Some reforms were made, but the two countries are still battling over whether more needs to be done. Recall that Reuters news reported yesterday that, “The United States has agreed to cut its maximum agricultural subsidies in a ‘significant step’ towards advancing negotiations on a new global trade pact, the mediator of the farm talks said on Thursday. “Crawford Falconer, New Zealand’s ambassador to the World Trade Organisation (WTO), said Washington had for the first time agreed to cut its subsidies to levels he proposed in July. With respect to this development, a recent AFP article reported that, “Diplomats at the World Trade Organisation said the US agricultural negotiator, Joseph Glauber, had announced during talks late Wednesday that the United States accepted WTO proposals on subsidy cuts made two months ago as a basis for negotiations. “It marked a shift in the US position on the compromise proposal suggesting a limit of 12.8 to 16.2 billion dollars (9.2-11.6 billion euros) a year on its agricultural subsidies. “Until now, Washington has refused to accept a ceiling below 23 billion dollars. “‘I had never heard them say that before. It’s not a small thing,’ said Crawford Falconer, the New Zealand ambassador chairing the farm negotiations. And Dow Jones News writer William Echikson reported yesterday that, “A new U.S. willingness to cut its farm subsidies is positive and could help conclude a global trade deal, the European Commission said Thursday. “‘We have already welcomed’ the U.S. move, said Peter Power, the commission’s trade spokesman. Mr. Echikson noted that, “European farm subsidies and high tariffs also have been a subject of contention. “Earlier this week, E.U. Trade Commissioner Peter Mandelson said talks has made more progress than people realize and a deal is almost done on key issues. For more on the perspective of Commissioner Mandelson, see this video item from the Council on Foreign Relations, “C. Peter McColough Series on International Economics: A Conversation with Peter Mandelson,” which was posted earlier this week. Despite some positive reaction following the news associated with the U.S. position on domestic levels of farm support, Bloomberg news writer Jennifer M. Freedman reported yesterday that, “U.S. willingness to accept proposals limiting farm subsidies and opening markets to both agricultural and industrial goods probably won’t be sufficient to lead to a global trade agreement this year. The Bloomberg article stated that, “Still, two ‘basic problems’ continue to dog WTO talks and make it unlikely that the more flexible U.S. position will lead to a quick agreement, Gardner said. “The U.S. remains ‘particularly vulnerable’ because most of its domestic aid is in the most damaging classifications and would therefore be subject to substantial reductions, he said. A group of developing countries including Brazil, China, India, South Africa and Mexico are pressing for limits on U.S. aid. “The second big obstacle is the European Union’s insistence that its most sensitive products remain in a category in which they are subject to lower aid reductions. The EU is ‘not moving as far as the U.S. would like on market access,’ Gardner said. Scott Patterson, writing today at The Wall Street Journal Online, provided an interesting analytical look at the price of ethanol and corn, and indicated that the market price of these two agricultural commodities could have an impact on inflation. “Investors are starting to worry that the Federal Reserve’s interest-rate cut could stoke inflation by heating up the economy and hurting the dollar. But the Fed could get help from an unlikely arena: ethanol. “The price of ethanol soared earlier this year to record levels of more than $4 a gallon as the Bush Administration vowed to boost production of alternative fuels. That drove up the price of corn, a key ethanol ingredient,” the Journal said. Mr. Patterson then stated that, “Ethanol prices have slumped in recent months, to less than $1.70 a gallon. Demand for the gasoline substitute has remained strong, but production has been stronger as producers rushed to cash in on the boom. “That has cut into profits margins and ethanol producers are cutting back. Construction on new ethanol plants is down more than 60% from last year, according to Friedman Billings Ramsey analyst Eitan Bernstein. “Corn prices are also off, down about 25% from this year’s peak, in part due to expectations for a bumper corn crop, according to government estimates. Fewer plants coming on line could also hit corn prices, says Mr. Bernstein. 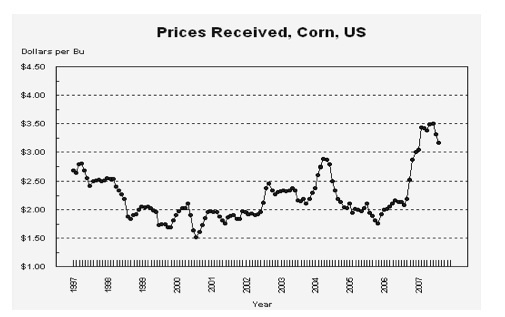 As a reminder for just how high corn prices still are from an historic perspective, see this chart, which was included in the August Agricultural Prices report. In a related article, Des Moines Register writer Jerry Perkins reported today that, “Early signs of a shakeout are rumbling through the ethanol industry, which will lead to more plants being owned by fewer and bigger investors, a leading biofuels venture capitalist said Thursday. “Sano Shimoda of BioScience Securities Inc. in Venice, Calif., said at the first Renewable on Parade conference that investors who put their money into ethanol five years ago are smiling now because they profited from a surge in ethanol demand that led to skyrocketing high prices. The “Washington Insider” section of DTN noted yesterday (link requires subscription) that, “While the Senate Ag Committee farm bill debate is not yet a stalemate, it is clearly still out of focus. Sen. Tom Harkin, D-Iowa, continues to schedule press briefings regarding ideas, alternatives and schedules. And, he said his committee will mark up its version of the bill in the next few days. However, congressional observers say the committee is still not ready — that Harkin has not yet been able to find enough agreement among panel members to clear a broad bill — and that he still has not been able to find adequate budget offsets for the programs he wants included. The DTN item indicated that, “In the meantime, committee members are said to be working on bills of their own. For example, Sens. Kent Conrad, D-N.D., Saxby Chambliss, R-Ga., and Blanche Lincoln, D-Ark., are expected to offer a bill of their own if Harkin proposes far reaching changes to traditional farm programs or too strict farm program payment caps. Numerous drafts of various Conrad-Chambliss ideas have been reported to be floating for weeks among farm-state lawmakers and association lobbyists. Concluding, the “Washington Insider” analysis stated that, “Yet another rumor about farm bill progress was that if the Ag Committee felt it could not agree on a bill, the Senate could take up the House farm bill instead — a procedure being actively pushed by some members of the House Agriculture Committee. However, congressional sources say that the Senate leadership is unlikely to go that route, and that Senate Majority Leader Harry Reid, D-Nev., has told senators that ‘no such strategy is at hand.’ Harkin repeated that theme on Tuesday. Robert Pore, writing yesterday at The Grand Island Independent Online (Nebraska) reported that, “Sen. Ben Nelson, D-Neb., said difference between Democrats about the new farm bill and how to fund it will be ironed out and Senate debate on the farm bill could begin early next month. Mr. Pore noted that, “The current farm bill expires Sept. 30, but Congress is expected to pass a continuing resolution that will extend the 2002 farm bill for about a month. “Nelson, a member of the Senate Agriculture Committee, said the next farm bill must meet budget spending parameters, which are at the heart of debate among Democrats and special interest groups seeking funding for their particular programs. The article added that, “But Nelson said even if a markup is accomplished and the Senate passes its farm bill version, a House/Senate conference committee then has to hammer out their differences. Mr. Johanns’ letter of resignation can be viewed here, while a transcript of a news conference with President Bush regarding Mr. Johanns’ departure can be viewed here. * Joseph Morton. “Trade hallmark of Johanns’ tenure as U.S. agriculture secretary.” Omaha World Herald. 9.21. * Ian Swanson. “Senators praise Bush’s pick to succeed Mike Johanns.” The Hill. 9.21.